How can ATVs be a hidden danger? ATVs are big and loud and might seem inherently dangerous, but they also look like they are a lot of fun to ride. Other kids seem to be riding them, and they even have parks and trails where you can ride them, so how can they be dangerous? You can even rent them when you are on vacation at most popular resorts. These are all factors that override a parent's instinct about the dangers of ATVs for kids and make ATVs good candidates for a hidden danger. ATV accidents aren't rare. There are about 100 to 150 ATV related deaths in children and teens under age 16 each year and about 40,000 injuries treated in emergency rooms. a 13-year-old in Augusta, Kansas died when the ATV he was riding in with a friend rolled over on top of him. a 17-year-old in Freeport, Minnesota died when he crashed his ATV at the end of his driveway. a 17-year-old in Washington, Vermont died when he crashed into a tree while riding on his ATV. The teen was a popular ATV racer. a 14-year-old near Holland, Indiana died when he lost control of his ATV, which then hit a tractor. a 13-year-old near Grantsville, Utah died when the ATV he was driving toppled on top of him as he swerved to avoid a branch. His father, who was riding with him, escaped with minor injuries. an 11-year-old in Hebron, Ohio died when the Polaris ATV he was driving, with two other boys, overturned. a 4-year-old in Box Butte County, Nebraska died when the ATV she was riding on with an 8-year-old flipped over. a 4-year-old in Summit, Pennsylvania died when the ATV he was riding on rolled on top of him. a 12-year-old in Mannsville, Oklahoma died when the ATV she was riding on overturned. a 17-year-old in Johns Creek, Georgia died when the ATV she was riding on overturned during a team-building retreat with her varsity volleyball team. a 9-year-old in Marble Falls, Texas died when the ATV he was driving flipped over. a 13-year-old, his 13-year-old cousin, and his mother died when the ATV they were riding in was hit by a car in Leake County, Mississippi. A 2-year-old was also seriously injured. a 16-year-old from Smithville, Mississippi died of a head injury when he lost control of his ATV, which went off the road, down an embankment, and into the woods. a 4-year-old near Dagmar, Montana died when the ATV she was riding on turned over. 9-year-old twins near Mount Vernon, Iowa died in an ATV accident in a creek that ran through a pasture. Four teens, 14-year-olds who were coming home from the Epworth Town & Country Days parade in rural Iowa died after their John Deere Gator utility vehicle was hit by a pickup truck that had run a stop sign. A 2-year-old in Johnson County, Iowa who died after he fell off an ATV he was riding on with his 11-year-old brother. An 8-year-old in Drumore Township, Pennsylvania who died when the ATV he was riding on rolled while he was riding by himself on his family's farm. A 13-year-old near Hamilton, Illinois who died when she ran a stop sign and was hit by a pickup truck. Another teen on the ATV was seriously injured. A 14-year-old near Sycamore, Kansas who died when a Polaris Ranger ATV overturned onto of him. From Texas, the teen was visiting family on their farm. A 13-year-old near Opp, Alabama who died when his Polaris Ranger ATV overturned. A 10-year-old near Five Mile Pass, Utah who died when the ATV he was riding on with his babysitter stalled and rolled down a steep hill, throwing them both off the 4-wheeler. A 13-year-old in Darlington County, South Carolina who died while riding an ATV with her twin sister and cousin. An 11-year-old in Jacksonville, Florida who was one of two passengers on an ATV driven by a 14-year-old. He was thrown off the back of the ATV when it hit a bump, causing fatal injuries. An 8-year-old in Portageville, Missouri who died when he pulled onto a farm road and was hit by a pick-up truck while riding his ATV. A 10-year-old near Blue Grass, Iowa died when the ATV he was riding on to close a gate in a pasture overturned, and he was pinned under it. A 5-year-old in Denver Township, Michigan died when the ATV he was riding on flipped over after its 15-year-old driver lost control. An 8-year-old near Coward, South Carolina died when the ATV he was riding on, which was being driven by a 13-year-old, was in an accident caused by a deer running in front of the ATV, causing it to flip over. He was not wearing a helmet. A 15-year-old in Wilcox County, Alabama, who had been missing for three days, was found at the base of a steep trail, apparently killed in an ATV accident while riding on a mud track near some deep woods. A 14-year-old in Oliver Springs, Tennessee died when the ATV she was driving overturned while she was on some off-road trails near her house. A 14-year-old in Cheshire Township, Ohio died when he hit a truck head-on while riding his ATV around a curve in the wrong lane of a public road. A 12-year-old in Kershaw County, South Carolina died after running off the road and into an embankment while riding an ATV without a helmet. A 12-year-old near Hagerstown, Maryland died at Johns Hopkins Children's Center a few days after the ATV he was riding on overturned in the driveway of his home. A 12-year-old near Palatka, Florida died this week after the three-wheeled ATV he was riding flipped over and landed on him. He was not wearing a helmet and was riding on private property. A 7-year-old boy from Butte, Montana died when the ATV he was riding on with his 12-year-old brother rolled over. A 16-year-old died when his ATV crashed into a tree in Havre de Grace, Maryland. A 14-year-old died when she lost control of the ATV she was driving near Williamsburg, Virginia. Two teens were killed and another was in critical condition after their ATV crashed near El Paso, Texas. A 7-year-old was killed when the ATV she was riding on with another 7-year-old and an 11-year-old hit a retaining wall and rolled on top of her near Wagoner, Oklahoma. A 14-year-old from South Carolina died when the ATV he was driving overturned and struck a tree. A passenger of the ATV was seriously injured and is reportedly in the hospital. A 14-year-old was critically injured in an ATV accident when the ATV she was riding with three other people hit a light pole near Katy, Texas. A 14-year-old suffered a serious head injury when he fell off his ATV in South Texas. A 9-year-old girl near Lake Texoma, Oklahoma died when the ATV she was driving flipped over, also injuring an 8-year-old passenger on the ATV. A 15-year-old in Allegan County, Michigan, died when his ATV rolled on top of him as he tried to make a turn at too high a speed. He was wearing a helmet. ATVs aren't toys. 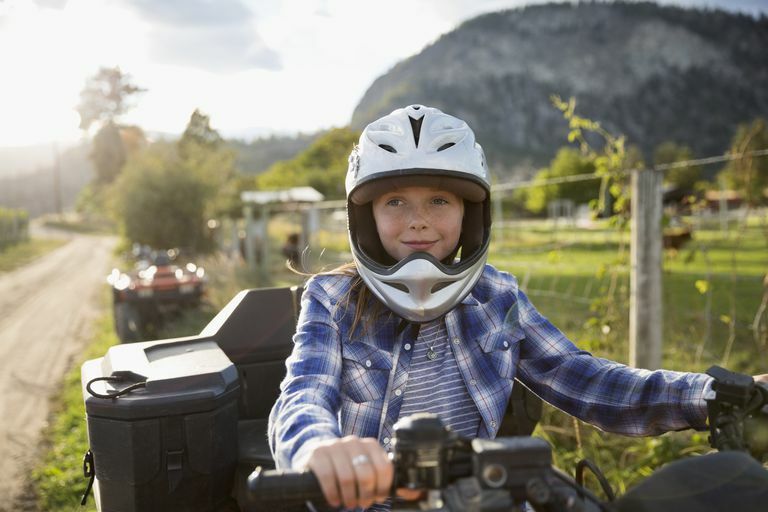 Think twice before letting your kids ride an ATV, and make sure you — and they — understand the risks. And then think again about ATV safety if you are still going to let them ride an ATV. American Academy of Pediatrics Policy Statement. All-Terrain Vehicle Injury Prevention: Two-, Three-, and Four-Wheeled Unlicensed Motor Vehicles. Pediatrics 2000 105: 1352-1354. U.S. Consumer Product Safety Commission. ATV Safety Messages. U.S. Consumer Product Safety Commission News Alert. CPSC Warns Memorial Day Weekend Among the Deadliest Holidays for ATV Riders.